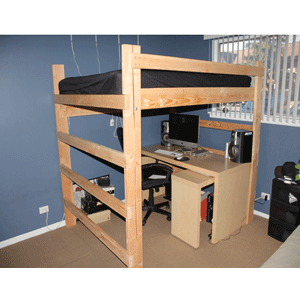 A loft bed is an elevated bed allowing you to use the space underneath for items such as a desk, shelves, futon, dresser or computer gaming center. Combining casual design with function, this loft bed will be perfect for a bedroom in your home. The bed features two lofted beds and a built-in futon for a stylish, functional design. An open area underneath one of the beds offers a place to store a bookcase, dresser or desk. Combining casual design with function, this loft bed will be perfect for a bedroom in your home.